If you are a mountain biker, you must know those three contact points where your body and bike meets. They are the bike seat, bike handle, and bike pedals. So, it is important to provide a suitable interface as well as a better element of control. Pedals are the interface where your leg transmit the power into the drivetrain to compel you along the track. So, pedals are the crucial part which helps the bike to move around. They are double-sided and considered as the crucial platform for each foot. Generally, it has some extra grip which is provided by pin strategically placed on them. As pedals are responsible for the whole control, it is essential to make a practical choice. That’s why we brought a list of best mountain bike pedals for you. 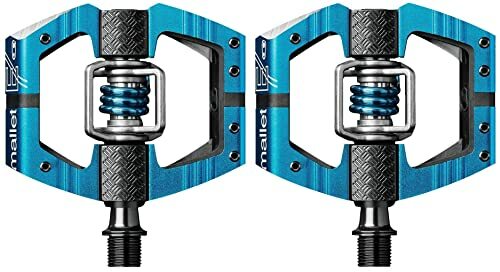 Mountain pedals are reliable, durable, and stable than other flimsy stock pedals. So, it is the time to replace the flimsy stock pedals with mountain bike pedals. From a casual trail ride to the risky gravity runs, you need a set of perfect bike pedals. But, this is a difficult job to choose one among the massive collections. They come in a variety of size, shape, and styles. Which means there should be a balance in a perfect set of mountain bike pedals. We tried dozens of pedals by valuing the versatility, durability, and ease of use. 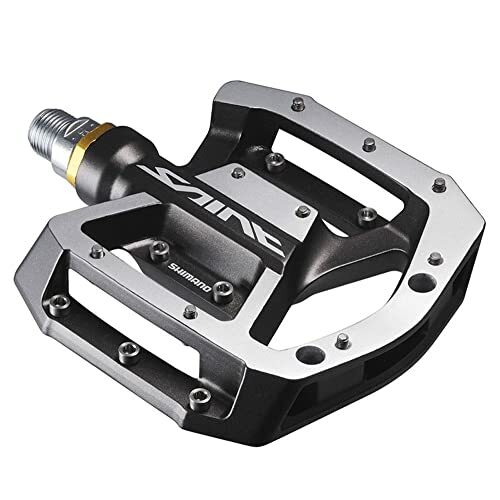 After that, we have shortlisted ten best mountain bike pedals. Read our complete article to know more about our recommendations. SHIMANO is a very well-known and trusted brand among mountain bikers. This Shimano XTR is the most reliable and durable pedal set with stylish outlook. The pedals set has a great combination of a large platform while keeping the weight down. An aluminum body platform provides enough space to support your foot in emergencies. This large pedal-to-shoe platform ensures the efficient power transfer and ultimate control over the wheel. The pedals have sealed-cartridge spindle bearing that keeps the moisture out, so you need no times for maintenance. The bearing will spin smoothly than most other pedals. Also, the mud-shedding design allows the debris and mud to be flushed out when the rider steps into the pedals. The engagement mechanism has an anodized coating that enables easy clipping in and out. The entry and release of the pedals are so smooth that you can set them without any practice. You can release the cleats by twisting sideways. Overall the function of the pedals is reliable and durable. Though the price is a bit high, it is worthy for the features. 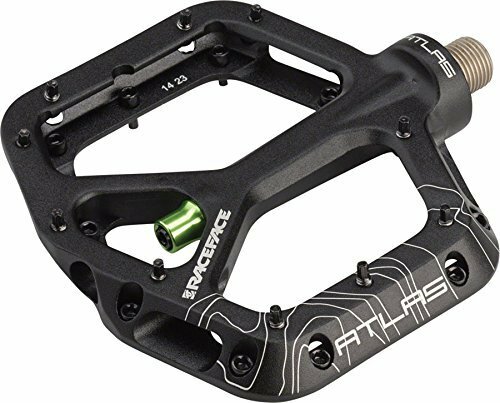 RaceFaceAtlas pedals have a lightweight and wide-aluminum body with a double concave platform. The body is so perfect that fits most of the people. Also, the svelte design makes it an ideal choice for trail bikes. The fully sealed bearing design ensure the fast and lateral play while riding. The aluminum body with hex-head threaded pins provides more bites for double-duty performance. It also ensures that the pedals can endure the abuse, so you get a smoother run. The fore and aft angled bottom loading pins are screwed from the underside; which can be adjusted easily. The super thin concave is weighted only 365 grams which are so lightweight that the platform throws the mud away. The design is so perfect that it is fitted with most of the mountain bike. The wide aluminum body ensures the effective grip in your feet. The price is reasonable considering the design and construction. Make your ride smoother with SHIMANO road pedal. It shares many of the features of the Dura-ace and Ultegra versions. This road pedal comes with a carbon fiber composite body. Over the center of the body, there is a wide stainless steel plate to deal with wear. The overall weight becomes low, and the hardness increases because of the carbon fiber composition. The pedal enhances the power for race-winning acceleration. The durable aluminum body over the plate reduces flex pedal body wear. The wide bearing ensured the steady load distribution and consistency of the pedal. The release and entry tension operation is readily adjustable. The Shimano road pedal comes with a set of yellow cleats with a cleat cover. It will let you run mile after mile without slipping. Whether you are planning for a long trip in the weekend or you are about the challenge your friend, this road pedals will never let you down. The overall construction is lightweight and durable at a time. The price is low compared to the others. CRANKBROTHERS design policy has been simple since 1997 while making the most versatile pedals. They are globally recognized brand as world-class athletes test their products. This metal Enduro Pedal brings a longer forged scum Chrome-moly steel spindle. The integrated traction pad technology assures the refined fit and power transfer. A wide concave platform secures the better foothold. This concave platform includes six adjustable pins per side that ensure the grip. The chamfered edges reduce the chances of rock strikes. The pedal has a 4-sided entry that makes it easily adjustable from each side. The wider platform can shed the mud quickly. The main body of the pedals is made of aluminum where the wings are made of stainless steel. It has a customizable float and releases angle of 15o-20o. The pedals are sealed from the double side which includes cleats and hardware. In a word, it will provide you with an ultimate experience while crossing trail, mountains, or any other highway. You will get this exclusive pedals at a low price. Shimano dual platform bike pedal is a great combination of traditional platform and SPD step-in-design. This is one of the most popular and versatile bike pedals out there due to its reliability and simplicity. The double-sided platform makes it easy to use. The smooth texture of the pedal allows you to go clipless while using with a regular street shoe. You will get multi-release cleats along with the pedals. The flat side of the pedals includes removable traction pins that provide excellent grip and control. The other steep side works perfectly while biking in mountain and uneven roads. The easy clipping mechanism makes frequent clipping in and out which is compatible with cleats. The entry and release tension settings are adjustable so you can enjoy the hassle-free ride. Pedals are so lightweight because the body is made of aluminum and chrome-moly steel axle. Also, the platform is oversized that works great any shoes. Above all, it’s an all-in-one package for any regular mountain bikers. The steel spindle and the sealed cartridge provides the longer service. You are getting these pedals at a very low price. 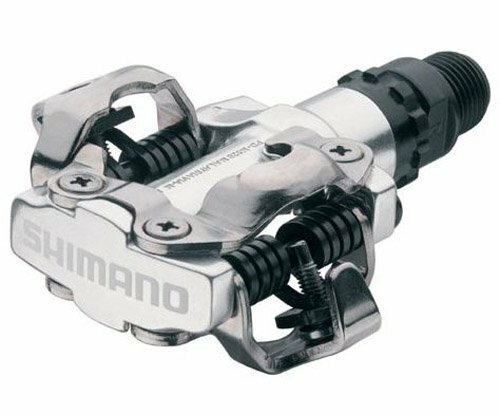 To make you riding amazing, here we have listed another multi-purpose Shimano pedals. This one has a combination of clipless or clip pedals. Where the bikers struggle a lot with regular one-sided pedals but M324 stands above all. The one side of the pedals has a typical caged platform where the other side is SPD pedals. The SPD side has a clip interface for rough use and the other platform to use with street shoes. The whole body is made of aluminum with barrel finish. The finishing will assure the comfortable use. It also includes a pair of 2-bolt cleats and a cleat retention adjuster. You can easily adjust the cleat retention to make it easy or harder to exit the pedals. The aluminum and steel construction makes the pedals more sturdy and durable. That’s why it’s a perfect choice for touring. The dual platform is a lifesaver at rough times. Above all, they are cost-effective at a time. These customizable DMR vaults are the slimmer and gripper version of V12 with excess reliability. Those bikers who are looking for a bigger platform, this is an excellent option for them. DMR vault provides the stronger grip and stability at any challenging trail. The oversized platform has 11 pins where seven pins are reversible. You can easily adjust the pin according to your choice of grip. The platform is wide enough that will hold your feet in any circumstances. The backside of the platform is a bit narrower than the front side. The gap in the platform allows the muds to fall off it stuck. The cartridge bearing made the pedals durable. The High load bushing ensures the pedals can bear the load. The aluminum and cro-mo steel axel body make the pedal lighter to use. So, boost your experience positively with these classy pedals. They are available in the market at a compatible price. Shimano SPD pedals are in our list because of their compact, unique, and sturdy features. Other general pedals can hardly beat this classic and reliable pedals. Most renowned cycling clubs have adopted these pedals due to their efficiency. They are famous in the states because of its longtime performance. They are a perfect choice for any competition also. These high-quality dual-sided pedals come with compact body design and open binding for easy entry. The adjustable entry and release operation allow you to unclip your feet by twisting out. The Chromoly steel sealed mechanism assure the low maintenance. It also includes Chromoly spindle, cartridge bearing axle, and SPD cleats. The MTB and road technology provides reliable performance. The main specialty of this pedal is that they are good at shedding mud and debris. They work fine even in the rain due to their SPD cleat system. Similar to other Shimano pedals, they are always top about their affordable price. They are probably the lowest priced among all other pedals. 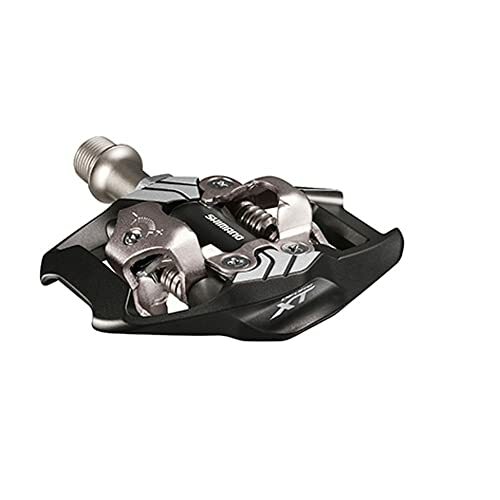 Shimano XT pedals combine the SPD mechanism with alloy platform. They are designed for train and mountain riding. It offers the legendary performance with superior grip. The large aluminum platform has ten pins on each side with two different length option. These pins can be adjusted to assure the maximum grip on the sole of your shoes. With different Q-factor, the platform provides the best fits. The fore-aft concave gives you comfort which is perfect for any aggressive riding. The sealed cartridge axle bearing assure the smooth spinning while biking. Its Chrome-moly spindle allows you to have a long ride in challenging terrain. The optimized platform fits any aged people. The aluminum body of pedals with Chrome-moly steel spindle makes it lightweight. Also, it has 8mm hex wench mount to clip it easily. It comes with a compatible price compared to the features. The best option for aggressive trail riding. If you are looking for high value and dependable set of clipless pedals than this one is an ideal option for you. 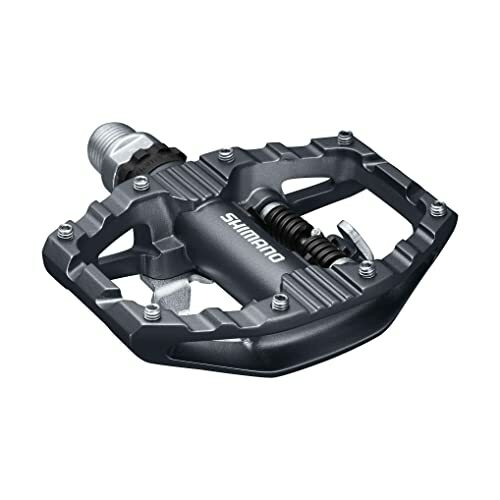 Similar to other Shimano XT series, these trail pedals provides the supreme stability in the toughest terrain. The classic design meets the needs of most of the world-class pro mountain bikers. 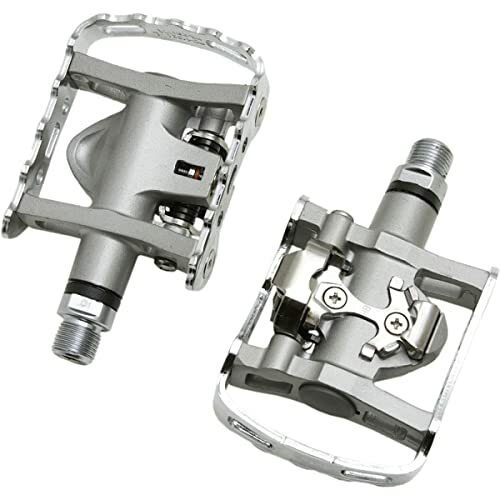 Besides the wider platform, this M8020 pedal is an upgraded version of M785. The pedal set allows the entry and releases tension settings so that you can adjust them according to your ride. The wider and thinner platform increase the shoe contact with better grip. The double-side pedal has an integrated cage in one side which increases stability and control. The strong retention claws assure the smoother engagement and release. The cleat-to-pedal interface shed the muds and avoid mud build-up even in horrible weather. They provide four degrees of float and integration with two bolt SPD cleats. 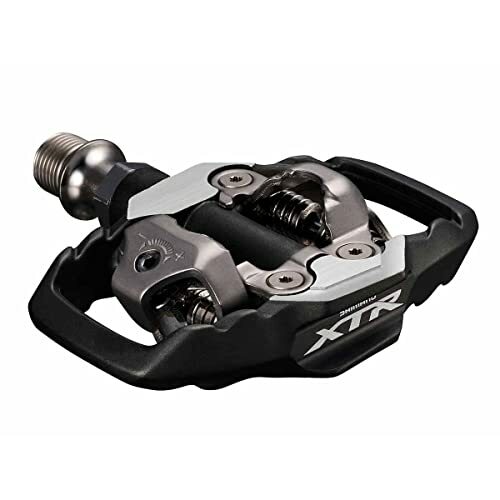 In a word, this XTR pedals are lighter and offers nice bearing setup and sealed SPD bindings. 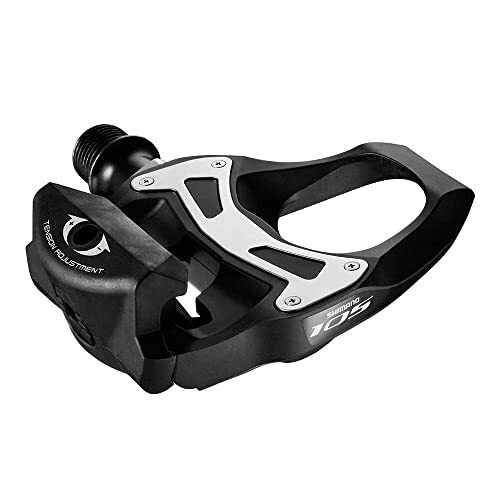 Like other Shimano XTR pedals, they are available at a compatible price. That’s why they are highly recommended by most of the professional bikers. As we said earlier that the bike pedal is an essential part of the mountain bike. An effective pedal transfer the power from your feet to the wheel to make the bike run for long. So, you can never compromise with the average bike pedals. Make sure to choose the best quality pedal that fits your size, design choice, and all other needs. We believe that you can match your needs with our reviewed pedals. 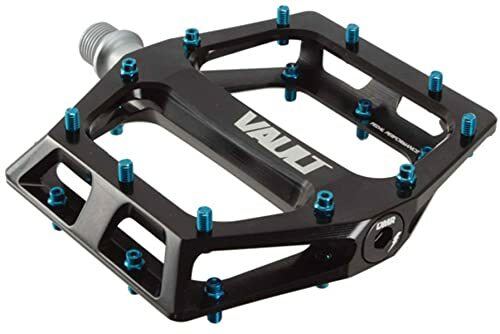 We hope this article was helpful to you for finding the best mountain bike pedals. The 10 Best Mountain Bikes Under 300 Dollars – Ultimate Guide 2019 Among all the outdoor activities, bicycling is always exciting.